The influence of growing fire-power on tactical defense is evident.... The defensive is able more than before to carry out its original mission, which is to break the strength of the attacker, to parry his blows, to weaken him, to bleed him, so as to reverse the relation of forces and lead finally to the offensive, which is the only decisive form of warfare. The dog days of August were at hand. The men in Eighth Army who survived that period spoke afterward of it as "the days along the Naktong." The Eighth Army no longer could withdraw when enemy pressure became oppressive. It had to stand and fight and hold, or be driven out of Korea. General Walker's defense plan centered on holding the road and rail lines running in a large oval east of the Naktong, from Pusan north through Miryang to Taegu, and hence east through Yongch'on to Kyongju, where they turned back south to Pusan. Any further withdrawal and loss of these lines of communication would render difficult any later U.N. attempt at a counteroffensive. The North Koreans, in preparing to attack the Pusan Perimeter and its communication system, had available four lines of advance toward Pusan: (1) through or past Masan south of the confluence of the Nam and Naktong Rivers, (2) through the Naktong Bulge to the rail and road lines at Miryang, (3) through Taegu, and (4) through Kyongju and down the east coast corridor. They tried them all simultaneously in August, apparently believing that if they did not succeed at one place they would at another. Along the Perimeter, the most important terrain feature for both the United Nations and the North Koreans-helping the former and hindering the latter-was the Naktong River, the second largest river in Korea. It formed a huge moat in front of almost three-fourths of the Perimeter. Its numerous great folds and bends resembled a huge snake contracting its length before coiling. Along its lower course, the river is generally from one-quarter to half a mile wide and more than six feet deep. Great sand beaches appear at many places when the river is not swollen by rain. Hills come down close to the water's edge on either bank, and rice paddy valleys of varying sizes finger their way among the hills. In Korea, the term hill came to mean to the soldiers anything from a knoll to a towering mountain. A few of the hills bordering the lower Naktong below Taegu on the east side rise to 1,200 feet elevation; three or four miles back from the river they climb to 2,500 feet. On the west, or enemy, side of the Naktong, the hills bordering the river are higher than on the east, reaching 2,000 feet in many instances. North of Taegu, along the upper reaches of the river, from Waegwan in a semicircle east to Andong, the hills rise still higher, many of them to elevations of 2,000 and 3,000 feet. The line of the Naktong as organized by the American forces was a series of strongpoints on the highest hills, affording views of both the river and the natural avenues of travel from it. During the day, these points were hardly more than observation posts. At night they became listening posts and tight little defense perimeters. Some of the posts were manned only in the daytime. Others were held by no more than half a squad of men. No one expected these soldiers to fight in position; they were a form of intelligence screen, their duty being to observe and report. Jeep patrols during the daytime ran along the river road. Quite obviously, the river line was thinly held. Reserve troops some miles back from the river were ready to counterattack against any enemy crossing. Artillery and mortars were in positions back of the river. They were laid to fire on known ferry and other probable crossing sites. The role of the artillery and the mortars was to be a vital one in the Perimeter fighting; their fire could be massed, within limits, against any major enemy effort. The infantry and the artillery together were disposed so as to hold the commanding ground and control the meager road net. The roads necessarily were all-important. Northward from the confluence of the Nam with the Naktong, the 24th Division held the line of the lower Naktong for a distance of sixteen air miles, or a river front of about thirty-four miles. The 34th Infantry was on the lower, southern part; the 21st Infantry was on the upper part together with the ROK 17th Regiment. The 19th Infantry, just arrived from Masan, was re-equipping in the rear. In general terms, the 34th Infantry held the area west of Yongsan in the Naktong Bulge, while north of it the 21st Infantry held the area west of Changnyong. The 3d Battalion, 34th Infantry, held the river line in its regimental front, while the 1st Battalion was in a reserve assembly area about four miles back from the river near Yongsan. (Map 9) The 3d Battalion front was about nine miles, or 15,000 yards long. One may contrast this battalion frontage of 15,000 yards with one of 10,000 yards for a division at full strength, which U.S. Army doctrine considered normal. For almost the entire regimental front, hills 500 to 600 feet high rose from the narrow river valley, in some instances abruptly from the water's edge. In this nine miles of front two valleys formed entrances from the river into the hill masses stretching eastward. The northern entrance was at the Ohang village ferry crossing This crossing lay in the gap between I and L Companies at the northern edge of the bulge. The other natural entrance into the regimental zone lay four air miles south at the under side of the bulge. The 4.2-inch mortars supporting the 3d Battalion were about a mile and a quarter back of the river in the draw that penetrated the hills from the Ohang ferry site. The 3d Battalion command post was half a mile farther, southeast in this same draw, at the village of Soesil. Commanding the battalion was Lt. Col. Gines Perez, just arrived from the United States. At Yongsan, six miles east of the river, Colonel Beauchamp had his regimental command post. The first enemy crossings of the Naktong River, west of the Andong mountain barrier, other than reconnaissance patrols, came on 5 August at three different places. Two were north of Waegwan in the ROK Army sector. The third was thirty miles south of Waegwan opposite Yongsan in the 24th Division sector, in the big bulge of the Naktong. This third crossing of the river was made by the N.K. 4th Division and was the one to have consequences which first threatened the Perimeter. By 4 August, the N.K. 4th Division had concentrated its three regiments in the vicinity of Hyopch'on and was studying the American dispositions and defenses opposite it on the east side of the Naktong. An officer from the division headquarters, captured later, estimated the division had a total strength of about 7,000 men at this time with about 1,500 men in each of the infantry regiments. Colonel Beauchamp, the 34th regimental commander, at 0520 reported to General Church: "Enemy are across river in force in center of my sector. It's pretty dark and situation is obscure. I am committing my reserve [1st Bn] at daylight to clear up the situation. Get me a liaison plane in the air at dawn." Beauchamp ordered Ayres to counterattack with the 1st Battalion and restore the regimental position. At dawn there was no indication that the rifle companies of the 3d Battalion on the hills along the river, except L Company, had yet come under attack. Some elements of L Company had been forced out of position and withdrew about a mile from the river. The enemy apparently was content to leave the river line troops alone except where they lay across his axis of advance. He was concentrating on penetrating behind the river positions. 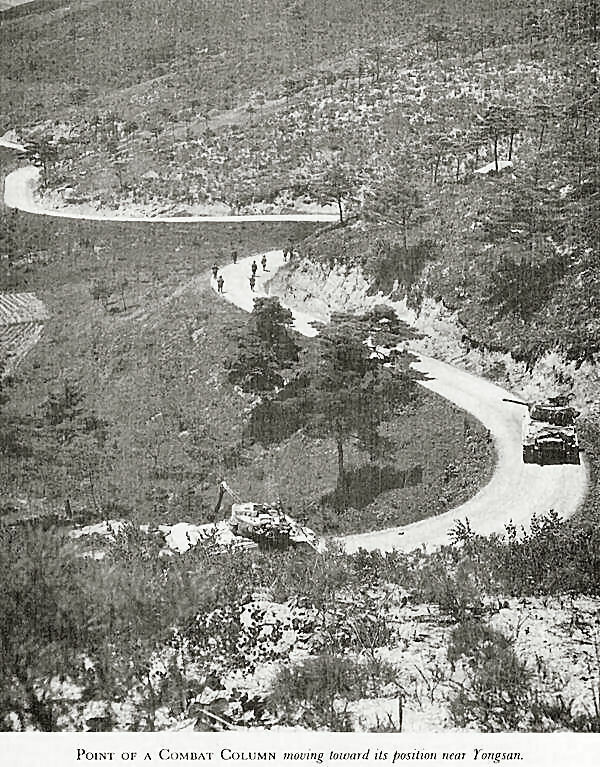 Upon receiving the order to counterattack straight down the Yongsan-Naktong River road, Colonel Ayres directed his executive officer to mount C Company in trucks and send it down the road until he, Ayres, stopped it. Behind C Company, A, B, and the Weapons Companies under the executive officer were to follow on foot. Just the day before, 187 replacements had joined the battalion. Ayres hurried to Capt. Clyde M. Akridge, who had been in command of C Company only a few days, and directed him to attack and seize the high ground above the former 3d Battalion command post. Akridge organized his company and started forward as enemy fire gradually increased. In leading the attack, Captain Akridge was wounded three times and was finally evacuated. The light tank in the lead fired on the grist mill, supposing it to be enemy held, and scored a direct hit. This fire killed one, mortally wounded two, and wounded less severely several other C Company men inside. Then the tank and A Company men came charging up to the mill where several survivors of C Company had been fighting off North Koreans since early morning. North Korean soldiers several times had rushed to within grenade range of the building but had not succeeded in entering it. Inside, the men had stacked their dead against the walls to protect the living from small arms fire. Thus, after a day-long ordeal, the survivors were rescued by the A Company attack. While A Company pushed on to the river, B Company dug in on part of Cloverleaf Hill. Quiet gradually settled over the area. The day's action made it clear that the North Koreans had penetrated eastward north of the Yongsan-Naktong River road to Cloverleaf Hill, but had not yet crossed south of the road to Obong-ni Ridge. Cloverleaf and Obong-ni together formed a high backbone across the Yongsan road about three miles east of the Naktong River and nearly halfway to Yongsan. The day's action had not been without creditable performances by the American troops. The counterattack of the 1st Battalion, 34th Infantry, had driven back the enemy's advanced units and regained part of Cloverleaf Hill. This, together with the fact that K, L, and A Companies held hill positions above the Naktong without any sign of panic, prevented the enemy from seizing at the outset the road net through Yongsan. Also, it gave time for the 19th Infantry, and later the 9th Infantry, to move up for counterattack. From the crests of Cloverleaf and Obong-ni the North Koreans could see the American main supply road stretching back to Yongsan five miles away and, for a distance, beyond that town toward Miryang. Cloverleaf (Hill 165), as its name indicates, is shaped like a four-leaf clover with its stem pointing north. Cloverleaf is somewhat higher than Obong-ni Ridge across the pass to the south of it. Obong-ni Ridge is a mile and a half long, curving slightly to the southeast with a series of knobs rising from 300 to 500 feet above the rice paddies at its base. The road, where it passes between Cloverleaf and Obong-ni, follows a winding, narrow passage of low ground. The village of Tugok (Morisil) lies at the southern base of Cloverleaf just north of the road. Obong village lies at the eastern base of Obong-ni Ridge half a mile south of the road. These two related terrain features, Cloverleaf Hill and Obong-ni Ridge, were the key positions in the fighting of the Naktong Bulge. The battle was to rage around them for the next ten days. On the morning of 7 August, while the North Koreans were seizing Cloverleaf Hill and Obong-ni Ridge, Col. John G. Hill received a summons to come to the 2d Division headquarters. There he learned from the division commander that General Walker had ordered the 9th Regiment (-) to report to General Church. Hill started his troops to the bulge area at 0130, and reported to General Church about 0830, 8 August. Church told Hill he wanted him to attack at once and drive the North Koreans from the bulge salient. After some discussion it was agreed that the 9th Infantry would attack at 1600. The 9th Infantry, at full strength in troops and equipment and its men rested, contrasted strongly with the regiments of the 24th Division on the line. On 8 August, the strength of the 24th Division regiments was approximately as follows: 34th Infantry, 1,100; 19th Infantry, 1,700; 21st Infantry, 1,800. The combat effectiveness of the 24th Division then was estimated to be about 40 percent because of shortage of equipment and understrength units. Fatigue and lowered morale of the men undoubtedly reduced the percentage even more. The enemy by now had begun to show increased interest in the hill positions along the Naktong still held by American troops. At dawn on 7 August, Captain Alfonso of A Company, 34th Infantry, discovered that the enemy had occupied the ridge on his right which overlooked his position. By radio he directed artillery fire on the hill. When he started a patrol out to determine the result, enemy fire drove it back. An airdrop of supplies that afternoon was only partially successful. The company recovered little more than half the drop and lost some men to enemy fire in the process. The night passed quietly. The next morning, 8 August, Alfonso's men could see North Koreans crossing the Naktong below them in six boats, each holding about ten to twelve men. They radioed for an air strike, and later, at a range of 1,000 yards, engaged the enemy force with their .50-caliber machine gun, causing the North Koreans to disperse along the river bank. There the air strike came in on them, with undetermined results. That afternoon, the North Koreans began registering mortar and artillery fire on A Company's position, but ceased firing as soon as their registration was accomplished. Alfonso and his men noticed an enemy column far off, moving toward them. From this and the mortar and artillery registrations, they concluded that the enemy would deliver a co-ordinated attack against them that night. Alfonso requested permission to withdraw at 2300, and this was approved by both the battalion and regimental commanders. That evening General Church placed Colonel Hill in command of all troops in the Naktong Bulge. The troops comprised the 9th Regimental Combat Team (less the 3d Battalion), 2d Division; and the 34th and 19th Infantry Regiments, and the 1st Battalion, 21st Infantry, 24th Division, together with supporting artillery and other attached units. This command was now designated Task Force Hill. As it chanced, enemy reinforcements reached the east side of the river during the night and vastly increased the difficulty of this attack. Colonel Hill had received reports as early as 8 August that the North Koreans were working at night on an underwater bridge across the Naktong at the Kihang, or Paekchin, ferry site in the middle of the bulge. The enemy 4th Division completed this underwater bridge during the night of 710 August, and before daylight had moved trucks, heavy mortars, and approximately twelve artillery pieces to the east side of the Naktong. Some of the equipment crossed on rafts. Additional infantry units of the enemy division also crossed the river during the night. A few tanks may have crossed at this time. By the morning of 11 August, therefore, five days after the initial crossing, the North Koreans had heavy weapons and equipment across into their bridgehead. The North Koreans built many underwater bridges across the Naktong during August, 1950. They consisted of sandbags, logs, and rocks to a point about one foot below the surface of the water. In effect, they constituted shallow fords. In muddy water they were hard to detect from the air. Underwater bridges similar to them had been built, and used extensively, by the Russians in World War II, often as a surprise factor in battles on the Eastern Front. They played an important part, for instance, in the crucial battle of Stalingrad. During 10-11 August, when the North Korean build-up on Obong-ni and Cloverleaf was increasingly apparent, enemy groups also began to appear in the extreme southern part of the 24th sector. By 11 August there was unmistakable indication that enemy forces in some strength had moved around the main battle positions at Cloverleaf and Obong-ni and were behind Task Force Hill. 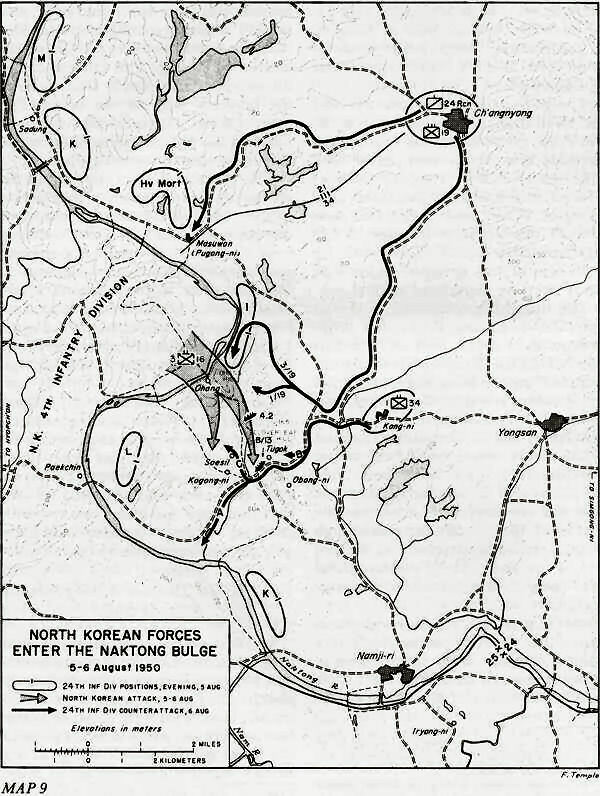 That night, 11-12 August, North Koreans built up their roadblock east of Yongsan to greater strength and extended it to a point three miles east of the town. A staff officer awakened Colonel Hill before daylight to inform him that the enemy had ambushed several ambulances and trucks two miles east of Yongsan. Although hard-pressed at Cloverleaf, Hill immediately ordered F Company, 9th Infantry, out of the line there and dispatched it together with a platoon of mortars to attack the roadblock. The 15th Field Artillery Battalion helped by turning some of its guns to fire on it. Still another American reinforcement had been converging on the enemy at Yongsan-the 1st Battalion, 23d Infantry, of the 2d Division. This battalion had just arrived at Miryang where it received orders to attack west. In this, its first action, it had nine cases of heat exhaustion but only one battle casualty. Some of its troops met an advanced unit of the 27th Infantry a mile east of Yongsan. Thus, by evening of 13 August, General Walker's prompt action in committing the 27th Infantry, together with the 24th Division's employment of headquarters and engineer troops, had eliminated the dangerous enemy penetration south and east of Yongsan. Enemy action in the southern part of the 24th Division sector from 10 to 13 August convinced Colonel Hill that K and L Companies were doing no good in their isolated hill positions near the Naktong. Accordingly, he issued orders-received by the 3d Battalion, 34th Infantry, at 0200, 14 August-for these companies to abandon their positions and assemble in the rear of the 1st Battalion as regimental reserve. They carried out this movement without incident. During the enemy infiltration around Yongsan, fighting continued at Cloverleaf, Obong-ni, and northward. There, the 9th Regimental Combat Team, the 19th Infantry, and elements of the 34th Infantry succeeded in denying gains to the enemy division, and so tied down its main force that the N.K. 4th Division could not exploit its penetrations southward. [Caption] POINT OF A COMBAT COLUMN moving toward its position near Yongsan. Monday, 14 August, dawned over the bulge area with a heavy overcast of clouds. Rain had been falling since 0300. This prevented the planned air strike. The 24th Division artillery, down to an estimated 40 percent combat effectiveness at this time, had massed most of its guns in the low ground just west of Yongsan under the command of Lt. Col. Charles W. Stratton, Commanding Officer, 13th Field Artillery Battalion. These guns delivered a 10-minute preparation. Then the infantry moved out. The two battalions of the 9th Regimental Combat Team, the 1st on the right and the 2d on the left, started up the slopes of Cloverleaf, while B Company, 34th Infantry, began a holding attack against Obong-ni south of the road. Although it almost reached the top of Obong-ni early in the morning, B Company was driven back by 0800. Elsewhere, the North Koreans fought Task Force Hill to a standstill. Colonel Hill had used all the resources at his command and had just barely held the enemy on his front. Having no reserve he was powerless to maneuver. General Walker's decision on the 15th is only one of many that could be mentioned to illustrate the command problems he had to face during the two and a half months of the continuing battles of the Pusan Perimeter. Serious trouble had developed at many places at this time. A quick glance around the Perimeter for the period 11-15 August will show that Eighth Army reserves were needed almost everywhere. Task Force Kean suffered its severe setback at Bloody Gulch on 12 August. At the same time Task Force Hill had failed at Obong-ni Ridge and Cloverleaf in the Naktong Bulge and strong elements of the N.K. 4th Division were behind it near Yongsan. In action yet to be described, the North Koreans had crossed the Naktong and were approaching Taegu north of the bulge. Eastward, the ROK forces were being driven back at a steady pace and the Perimeter was shrinking visibly in that quarter. The N.K. 5th Division had entered P'ohang-dong on the east coast and was in position to drive down the Kyongju corridor to Pusan. Beginning in the second week of August 1950, and continuing for the next six weeks, the two forces locked in combat at nearly all points of the Perimeter. Because it is necessary to separate the far-flung conflict into parts in order to describe it, an element of distortion is thus introduced into the Pusan Perimeter story. As the reader follows each single action for this period he must constantly keep in mind, if he is to view the scene at all as the contemporary commanders did, that equally intense and costly struggles were in progress elsewhere. Because of this multiplicity of battles taking place simultaneously at different parts of the Perimeter, it is difficult to describe satisfactorily the command problems daily confronting General Walker. He had to know, or guess correctly, where the next crisis would appear. Or, if surprised by an enemy action, he immediately had to find the means to meet it and act quickly. A commander has to think of all the actions in progress, or imminent, and make tactical decisions. balancing the needs of one part of his defense lines against those of others. A commander's viewpoint, hour by hour, is determined by changing factors of a complex situation. During the Pusan Perimeter battles in the summer of 1950 in Korea General Walker faced a trying time. As historical perspective is gained with the passing of time, Walker's chief claim to a high place in United States military history may well rest on the tactics of his masterful defensive operations on the Pusan Perimeter. In the midst of the battle of the bulge a new enemy crossing of the Naktong occurred in the 1st Cavalry Division sector, just above the 24th Division boundary. This enemy force, estimated at two battalions, established itself on Hill 409, a mountain near Hyongp'ung. Because the area concerned was more accessible by roads from the 24th Division sector than from the 1st Cavalry Division sector, General Walker on the evening of 13 August shifted the 24th Division boundary northward to include this enemy penetration. But this enemy force, fortunately and most comfortingly, made no effort to leave Hill 409 where it had established itself during a most critical moment of the bulge battle. Its inactivity within the American defense perimeter demonstrated either a lack of co-ordination by the North Korean command or an inelastic adherence to plans. Lt. Col. Harold S. Roise's 2d Battalion, 5th Marines, moved to its line of departure on the east side of a narrow valley in front of Obong-ni about 1,000 yards from the ridge crest. There it waited for the preliminaries to begin. The men studied intently the almost bare ridge opposite them, with its series of six knobs-Hills 102, 109, 117, 143, 147, and 153-rising progressively in height southward from 300 to 450 feet above the valley floor. Deep erosional gullies ran down from the saddles between the knobs leaving ribs of ground projecting from the ridge spine. About midway of the ridge a big landslide had exposed a large gash of red ground. Two companies, E on the left and D on the right, moved out from the line of departure at 0800, using the red gash on Obong-ni as the boundary between their zones of advance. Four platoons, numbering about 120 men, constituted the assault formation that crossed the valley and started up the slope. From the ridge itself they encountered no enemy fire, but from Tugok village across the road to their right (north) came heavy small arms and machine gun fire Some fire also came from their left flank near Obong village. Mortar fire fell on the assault group when it reached the slope of Obong-ni. Corsairs now returned and worked over the Obong-ni Ridge line and reverse slope with a hail of explosives. A shortage of fuel tanks prevented use of napalm. After the strike ended, the marines started upward again from halfway down the slope where they had waited. Tanks moved out into the low ground east of the ridge and supported the second attack by direct fire into Tugok village and against the ridge line. At first there was little enemy fire. Within a few minutes after the air strike had ended, however, the North Koreans moved into their forward foxholes at the crest. From these points they placed automatic fire on the climbing marines and rolled grenades down on them. Again, only Shinka's platoon reached the top. This time, starting with fifteen men, he had nine when he got there. The small group could not stay on the crest, and they fell back down the slope. Shinka crawled to the crest to see if he could find any marine wounded on top; enemy fire hit him twice, one bullet shattering his chin, another entering his right arm. He rolled down the hill. Enemy fire, inflicting heavy casualties, pinned the other units to the ground on the side of the ridge. At Obong-ni, the North Koreans again stopped the frontal attack of the marines. But this time, with enemy fire from Tugok and Cloverleaf almost eliminated, the right-hand platoon of B Company near the boundary with the 8th RCT was able to move to the right around the northern spur of Obong-ni and reach its crest here above the road. The marines captured this knob, Hill 102, about 1700. Then the next two knobs southward, Hills 109 and 107, fell to a flanking attack from the direction of Hill 102, supported by fire from that hill. Enemy fire from the next knob southward, Hill 143, however, soon forced the A Company platoon from the crest of Hill 117 back to its eastern slope. Just before dark the North Koreans made their first use of tanks in this battle of the Naktong Bulge. While digging in for the night, men on Hill 102 noticed three T34 tanks coming from the west. A fourth tank, not in view at first, followed. They came steadily along the road toward the pass between Obong-ni and Cloverleaf. By radio, B Company notified its battalion command post in the valley that tanks were approaching. Three American Pershings (M26's) clanked forward to positions at a curve in the road in front of the Marine 1st Battalion command post. The 75-mm. recoilless rifles already commanded the road where it emerged from the pass. Two 3.5-inch rocket launcher teams hurried into position at the north side of the road. Three Air Force P-51's sighted the enemy tanks and made several strafing runs over them but without visible effect. Marines on Hill 102 watched with fascination as the T34's rumbled into the pass. That evening, 17 August, American mortars and artillery registered on corridors of enemy approach to Obong-ni and Cloverleaf and on probable centers of enemy troop concentrations. Some artillery pieces fired on the river crossing sites to prevent enemy reinforcements arriving in the battle area. On Obong-ni that night, the marines, sure of an enemy counterattack, set trip flares in front of their positions. One quarter of the men stood guard while the remainder rested. On the left of the line, A Company had lost its 60-mm. mortars in the evening when four white phosphorus mortar shells struck in the mortar position, destroying the weapons and causing eighteen casualties. At 0230, 18 August, a green flare signaled the expected enemy attack. Coming from Hill 117, the North Koreans struck A Company and isolated one platoon. Their attack formation then drove on and penetrated into B Company. The glare from bursting 81-mm. mortar illuminating shells revealed the North Korean method of attack. An enemy squad would rise from the ground, hurl grenades, and rush forward a short distance firing to front and flank with automatic weapons, and then drop to the ground. Successive enemy groups would repeat the process. The attack forced A Company from its positions and back into the saddle south of Hill log. In its sector, however, B Company drove the enemy from its perimeter in forty-five minutes of hard fighting. Before daylight the North Korean attack ceased. 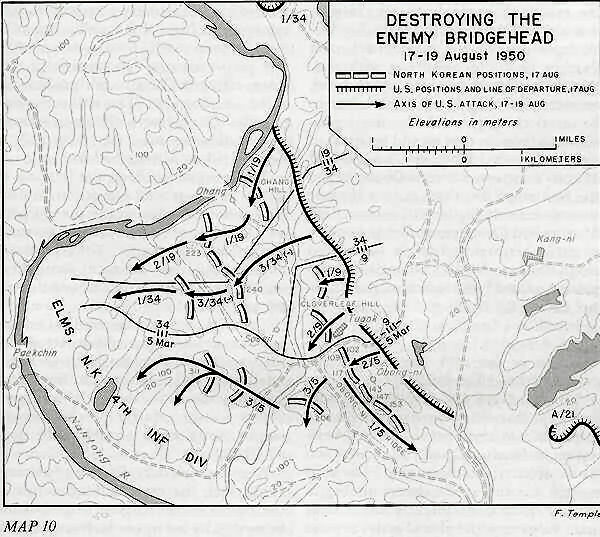 The total North Korean losses in this night battle was not known, although 183 enemy dead were counted later around the A and B Company perimeters. The attack now continued on across the saddle toward Hill 143. Air strikes and artillery fire greatly helped to win that point. The process was then repeated with Hills 147 and 153. At nightfall only one small pocket of enemy resistance remained on Obong-ni, and it was eliminated the next morning. The formidable ridge had been captured by an attack beginning on the right flank and moving progressively south and upward along its series of knobs and saddles. 1st Cav Div WD, Aug 50, G-2 Transl 0034, 191100 Aug 50. Ltr, Ayres to author, 5 June 53; Overlay of 3d Bn, 34th Inf positions, 6 Aug 50, prepared by Col Beauchamp for author. Beauchamp overlay, 6 Aug 50; Interv, author with Beauchamp, 1 Aug 52; Interv, author with Col Gines Perez, 6 Aug 51. New York Herald Tribune, August 6, 1950, dispatch from Korea, 5 August. GHQ FEC, History of the N.K. Army, pp. 41, 58, 75; 24th Div WD, 6 Aug 50; ATIS Res Supp Interrog Rpts, Issue 94 (N.K. 4th Div), pp. 43, 49. ATIS Interrog Rpt 612, Issue 1, p. 25, Lt Jun Jai Ro; EUSAK WD, 8 Oct 50, G-2 Sec, PW Interrog, ADVATIS 1074, Jr Lt Chon Cho Hong. Interv, author with Church, 25 Sep 52; Interv, author with Stephens, 8 Oct 51; Interv, author with Maj Sammy E. Radow, CO 1st Bn, 23d Inf, 16 Aug 51. Interv, author with Beauchamp, 1 Aug 52; Interv, author with Perez, 6 Aug 51; 13th FA Bn WD, 6 Aug 50; 24th Div WD, 6 Aug 50; EUSAK WD, 7 Aug 50, ATIS Interrog Rpt 452, ADVATIS 307, EUSAK 342, Lee Myong Hyon; ATIS Interrog Rpt 453, Kim T'ae Mo; ATIS Interrog Rpt 453, Col Pak Kum Choi. Colonel Pak gave the strength of the N.K. 26th Regt as follows: 1st Bn-500, 2d Bn-500, 3d Bn-800, Arty Bn-300, all other units-200; total regimental strength, 2,300. 24th Div WD, G-3 Jnl, entry 601, 061035 Aug 50; 3d Engr (C) Bn, Unit Hist, S-2 Sec, Summ, 6 Aug 50. Ltr, Ayres to author, 3 Jun 53 and overlay showing 3d and 1st Bn, 34th Inf, positions, 5 Aug 50; AMS 1:50,000 scale map of Korea, L751, 1950, Namji-ri sheet (6820-II). Ltr, Ayres to author, 5 Jun 53; Interv, author with Ayres, 18 Nov 54; 24th Div WD, G-3 Jnl, 6 Aug 50; 34th Inf WD, 6 Aug 50. 24th Div WD, G-3 Jnl, entry 571, 060520 Aug 50. Interv, author with Beauchamp, 1 Aug 52; Interv, author with Ayres, 18 Nov 54; 13th FA Bn WD, 6 Aug 50; 24th Div WD, 6 Aug 50. Ltr, Ayres to author, 5 Jan 53; Interv, author with Beauchamp, 18 Nov 54; Ltr, Beauchamp to author, 20 May 53, and attached comments. Ltr, Ayres to author, 5 Jan 53. 13th FA Bn WD, 6 Aug 50. 24th Div WD, 6 Aug 50; Interv, author with Cpl Stewart E. Sizemore (D Co, 34th Inf, 6 Aug 50), 30 Jun 51; Ltr, Maj Charles E. Payne to Ayres, 13 Dec 54, copy in OCMH; Interv, author with Ayres, 18 Nov 54. Ltr, Alfonso to Ayres, 27 Nov 54, copy in OCMH; Interv, author with Ayres, 6 Nov 54; Inter, author with Beauchamp, 18 Nov 54; Ltr, Ayres to author, 5 Jan 53; Ltr and comments, Beauchamp to author, 20 May 53. The 1st Battalion, 34th Infantry, had only 20 officers and 471 enlisted men when it began the counterattack on 6 August. See 34th Inf WD, 7 Aug 50. Ltr, Payne to Ayres, 13 Dec 54; Ltr, Alfonso to Ayres, 27 Nov 54; Intervs, author with Beauchamp, 8 Nov 54, and Ayres, 16 Nov 54. Ltr, Alfonso to Ayres, 27 Nov 54: Intervs, author with Beauchamp, 18 Nov 54, and Ayres, 16 Nov 54. Interv, author with Church, 25 Sep 52; Interv, author with Beauchamp, 18 Nov 54; 24th Div WD, 6 Aug 50, and G-3 Jnl. entries 593- 96, 061120-061150 Aug 50; 34th Inf WD, 7 Aug 50. Interv, author with Church, 25 Sep 52 24th Div WD, 6 Aug 50 and G-3 Jnl, entry 591, 061110 Aug 50. 24th Div Arty WD. 23 Jul-25 Aug 50. 24th Div WD, 6-7 Aug 50. Ibid., Opn Instr 18, 061900 Aug 50. 9th Inf WD, 8 Aug 50; 34th Inf WD, 8 Aug 50, 24th Div WD, 8 Aug 50; ATIS Interrog Rpt 602, 19 Aug 50, Issue 1, pp. 4-5, Lee Ki Sun, 2d Bn, 18th Regt, N.K. 4th Div. 19th Inf WD, 7 Aug 50; 34th Inf WD, 7 Aug 50. Tugok is represented on the 1:50,000 scale map of Korea as Morisil. To the troops at the time, however, this village was known as Tugok and that name is used in the text. Interv, author with Hill, 1 Oct 52; Brig Gen John J. Hill, MS review comments, 2 Jan 58. The designation (-) has been used to indicate a combat organization that is lacking one or more of its organic units. 24th Div WD, 8 Aug 50. Interv, author with Hill, 1 Oct 52; Interv, author with Beauchamp, 18 Nov 54: Ltr and comments, Beauchamp to author, 20 May 53; 9th RCT Opn Ord 4, 081315 Aug 50: Ibid., Unit Rpt 1, 8 Aug 50. Interv, author with Hill, 1 Oct 52; 24th Div WD, 8-9 Aug 50. Ltr, Alfonso to Ayres, 27 Nov 54: Interv, author with Ayres, 16 Nov 54; 34th Inf WD, 9 Aug 50. 34th Inf WD, 9-11 Aug 50. 24th Div WD, 9-11 Aug 50: EUSAK WD, 22 Aug 50, ATIS Interrog Rpt 703, Kim Chi Ho; Hill, MS review comments, 2 Jan 58; Interv, author with Montesclaros, 1 Oct 52. In the 2d Battalion, 19th Infantry, F Company effectives numbered about 25; G Company, about 40; and E Company about 30. 24th Div WD, 10 Aug 50; EUSAK WD, Briefing for CG, 10 Aug 50; Ltr, Church to author, 7 Jul 53; Ltr, Hill to author, 15 Apr 53. 24th Div WD, 10-11 Aug 50; Intervs, author with Hill, 1 Oct 52, and Beauchamp, 18 Nov 54. 24th Div WD, 11 Aug 50; 9th RCT Unit Rpt 4, 10-11 Aug 50; ATIS Interrog Rpts, Issue Nr 1, p. 90, Nr 644, 21 Aug 50, Kim Dok Sam; Ibid., Issue Nr 2, p. 8. Rpt Nr 703; EUSAK WD, 28 Sep 50, ADVATIS Interrog Rpt of Maj Choe Chu Yong, Opns Officer, N.K. Arty Regt, 4th Div; Ltr, Hill to author, 15 Apr 53. 9th RCT Unit Rpt 4, 10-11 Aug 50; 24th Div WD, 11 Aug 50: EUSAK WD, 28 Sep 50, Interrog Rpt of Maj Choe Chu Yong; EUSAK WD, 18 Aug 50, G-2 Sec, ATIS Interrog Rpt 644. Kim Dok Sam, a ROK officer, monitored enemy radio conversations about N.K. artillery positions. 24th Div WD, 10-11 Aug 50; 27th Inf WD, 10 Aug 50; Ltr, Hill to author, 15 Apr 53; Ltr, Beauchamp to author, 20 May 53. 19th Inf WD, 11 Aug 50; 24th Div WD, 11 Aug 50; EUSAK WD, Aug 50 Summ, 10 Aug; Interv, author with Hill, 1 Oct 52; Ltr, Murch to author, 7 Apr 54. Interv, author with Hill, 1 Oct 52; 24th Div WD, 11-12 Aug 50; New York Herald Tribune, August 14, 1950, Bigart dispatch. General Order 111, 30 August 1950, awarded the Silver Star to 1st Lt. William F. Coghill for gallantry in this action, 24th Div WD. Interv, author with Hill, 1 Oct 52; Ltr, Church to author, 7 Jul 53. Ltr, Murch to author, 7 Apr 54; Interv, author with Murch, 18 Mar 54; 27th Inf WD, 11 Aug 50. Ltr, Murch to author, 7 Apr 54; 24th Div WD, 12 Aug 50; 27th Inf WD, 12 Aug 50; 2d Bn, 27th Inf WD, Aug 50 Summ of Activities. 27th Inf WD, 13 Aug 60; GHQ FEC G-3 Opn Rpt 51, 14 Aug 50; 24th Div WD, 13 Aug 50. 23d Inf WD, Aug 50 Narr Summ. 27th Inf WD, 14 Aug 50. 34th Inf WD, 14 Aug 50; Interv, author with Hill, 1 Oct 52; Ltr, Hill to author, 15 Apr 53. 9th RCT Opn Ord 5, 131300 Aug 50; 24th Div WD, 13 Aug 50; 19th Inf WD, 13 Aug 50; ATIS Res Supp Interrog Rpts, Issue 94 (N.K. 4th Div), pp. 48-49. 9th RCT Unit Rpt 9, 14 Aug 50, gives the strength of its 1st Battalion as 599 enlisted men and that of the 2d Battalion as 609 enlisted men, against an authorized strength of 883 enlisted men each. Ayres, Notes for author, 24 Jan 55. 9th RCT Unit Rpt 7, 13-14 Aug 50; Overlay to accompany FO 5, 9th RCT, 131230 Aug 50; 24th Div WD, 13-14 Aug 50; Interv, author with Hill, 1 Oct 52. Capt Perry Davis, The 2d Infantry Division in Korea, July-September 1950, MS, copy in OCMH (Davis was Public Info Off, 2d Div); Interv, author with Hill, 1 Oct 52. Interv, author with Hill, 1 Oct 52; Hill, MS review comments, 2 Jan 58; 24th Div WD, 14-15 Aug 50. Gugeler, Combat Actions in Korea, ch. 2, "Attack Along a Ridgeline," pp. 20-29; 24th Div WD, 15 Aug 50; Abstract of A Co, 34th Inf Morning Rpts, 14-15 Aug 50. In his account, Gugeler describes all the action as taking place on 15 August. Some of the preliminary incidents took place on the 14th, according to the morning reports of the company. Intervs, author with Church, 25 Sep 52, and Hill. 1 Oct 52. Interv, author with Church, 25 Sep 52. Collier, MS review comments, 10 Mar 58. EUSAK Opn Dir, 15 Aug 50: 24th Div WD, 16 Aug 50. The 24th Division headquarters received the formal order the morning of 16 August. 24th Div WD, 16 Aug 50; 9th RCT Unit Rpt 9, 15-16 Aug 50. 24th Div WD, 12-16 Aug 50; 21st Inf WD, 12-16 Aug 50; ATIS Res Supp Interrog Rpts, Issue 104 (N.K. 10th Div), p. 47; Capt William M. Glasgow, Jr., Platoon Leader in Korea, MS in OCMH (Glasgow was Ldr, 2d Plat, B Co, 23d Inf, ad Div); Interv, author with Stephens, 8 Oct 51; EUSAK WD, 5 Aug 50, G-3 Sec, Briefing for CG; 23d Inf WD, Aug 50 Summ. EUSAK WD, 30 Aug 50, ATIS Interrog Rpt 880, Paek Yong Hwan; ATIS Interrog Rpts, Issue 3, p. 180; 9th RCT Unit Rpt 7, 13-14 Aug 50. Interv, author with Church, 25 Sep 52; Interv, author with Hill, 1 Oct 52. 24th Div Opn Directive 1, 16 Aug 50; Ibid., Opn Instr 25, 16 Aug 50; Ibid., WD, 16 Aug 50; Ibid., Div Arty WD, 23 Jul-25 Aug 50; Wood, "Artillery Support for the Brigade in Korea," Marine Corps Gazette (June, 1951), p. 19; Interv, author with Hill, 1 Oct 52; Ltr and comments, Beauchamp to author, 20 May 53. 5th Mar SAR, 2 Aug-6 Sep 50, 16 Aug: 1st Bn, 5th Mar SAR, 7 Jul-6 Sep 50, 17 Aug: 24th Div WD, 17 Aug 50. Interv, author with Church, 25 Sep 52; 2d Bn, 5th Mar SAR, 7 Jul-31 Aug 50, pp. 8-9. 5th Mar SAR, 2 Aug-6 Sep 50, Incl 4, sketch of 2d Bn attack, and 17 Aug 50; Andrew C. Geer, The New Breed: the Story of the U.S. Marines in Korea (New York: Harper & Brothers, 1952). Geer interviewed survivors of the assault group. 2d Bn, 5th Mar SAR, 7 Jul-31 Aug 50, p. 9: Geer, The New Breed; Montross and Canzona, The Pusan Perimeter, p. 183; Newsweek, August 28, 1950; New York Times, August 18, 1950. 5th Mar SAR, 17 Aug 50; 1st Bn, 5th Mar SAR, Aug 50. Intervs, author with Church, 25 Sep 52, and Hill, 1 Oct 52. Ibid. ; 9th RCT Unit Rpt 10, 16-17 Aug 50. The author was unable to find the 9th Regimental Combat Team War Diary for August 1950. 1st Bn, 5th Mar SAR, 17 Jul 50; Geer, The New Breed, p. 71. 1st Bn, 5th Mar SAR, 17 Aug 50: 5th Mar SAR, 2 Aug-6 Sep 50. sketch 5. N.K. counterattack, night of 17-18 August; Geer, The New Breed. 24th Div WD, 17 Aug 50; 34th Inf WD, Summ, 22 Jul-26 Aug 50; 13th FA Bn WD, 17 Aug 50: 19th Inf Unit Rpt 38, 17 Aug 50; Interv, author with Montesclaros, 1 Oct 52; Ltr and comments, Beauchamp to author, 20 May 53. 1st Bn, 5th Mar SAR 17-18 Aug 50: Wood, "Artillery Support for the Brigade in Korea," op. cit., p. 37; Geer, The New Breed, p. 76. There is some discrepancy in the Marine casualty figures. 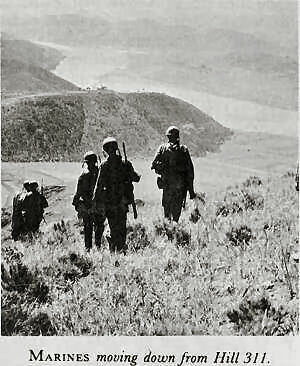 1st Bn, 5th Mar SAR, 18 Aug 50; Geer, The New Breed, p. 77-79; Montross and Canzona, The Pusan Perimeter, p. 200. 3d Bn, 5th Mar SAR, 18 Aug 50. Wood, "Artillery Support for the Brigade in Korea," op cit. ; ATIS Res Supp Interrog Rpt., Issue 94 (N.K. 4th Div). p. 49. 3d Bn, 5th Mar SAR, 18 Aug 50; 24th Div WD, 18 Aug 50; Interv, author with Montesclaros, 1 Oct 52. 3d Bn, 5th Mar SAR, 19 Aug 50; 24th Div WD, 19 Aug 50; 1st Prov Mar Brig SAR, 19 Aug 50, p. 13. Wood, "Artillery Support for the Brigade in Korea," op. cit. ; GHQ FEC Sitrep, 20 Aug 50; 24th Div WD, 19 Aug 50; 24th Div Arty WD, 22 Jul-25 Aug 50; ATIS Res Supp Interrog Rpt, Issue 94 (N.K. 4th Div), p. 49; EUSAK WD, 21 Aug 50, ATIS Interrog Rpt 705, Mun Il Pun; Ibid., 8 Oct 50, G-2 Sec, ADVATIS 1074, Jr Lt Chon Cho Hong, N.K. 4th Div Hq, said the 18th Regt had 900 men left; Ibid., 28 Sep 50, ADVATIS, Maj Choe Chu Yong, Opn Off, Arty Regt, 4th Div, said the division artillery crossed the Naktong with 12 guns and lost them all; ATIS Interrog Rpts, Issue 2, Rpt 703, p. 8, Kim Chi Ho; Interv, author with Church, 25 Sep 52. 2d Bn, 5th Mar SAR, 19 Aug 50, p. 9 (this source says there were 36 enemy machine guns on Obong-ni); 1st Bn, 5th Mar SAR, 18 Aug 50. GHQ FEC, History of the N.K. Army, p. 75: ATIS Res Supp Interrog Rpts, Issue 94 (N.K. 4th Div), p. 49. 24th Div WD, 19 Aug 50; 1st Prov Mar Brig SAR, 19 Aug 50; Ibid., 22 Aug-1 Sep 50, p. 14.